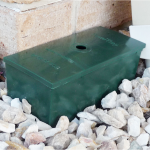 TermiteTraps are monitors, placed around buildings so foraging termites can easily discover them. 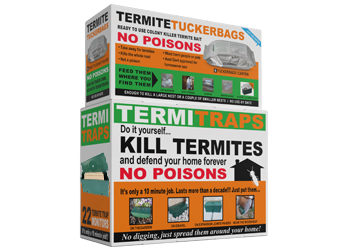 The more Traps used, the more likely and sooner termite scouts will find them. When they do, the Tassie oak timber is very attractive to Coptos, Schedos (and Mastos) and tunnels are constructed to this newly discovered food source. This is no different to termites finding their way into any bits of timber lying on the ground. 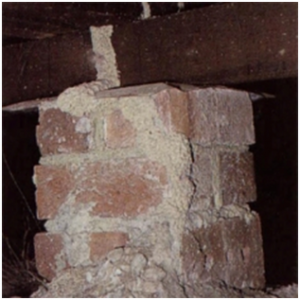 Termite damage to buildings is the result of them coming up out of the soil in their constant search for additional food sources. 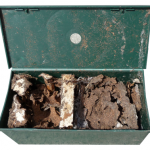 By placing TermiteTraps on surfaces above soil level, they are found faster compared to monitors buried IN the soil because that’s where termite scouts go ‘looking’. 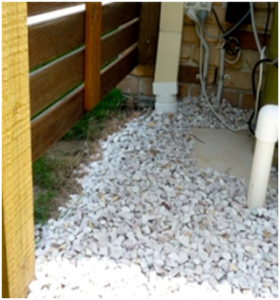 As TermiteTraps can be put on pavers and the expansion joints in concrete, the building can be surrounded. In-ground monitors can only be placed in lawns and gardens. The TermiteTrap bonus is — no digging! The on-ground claim is scientifically backed. Trials in the USA showed that 30 monitors placed on the ground were discovered before any of 30 monitors buried in the ground were discovered. 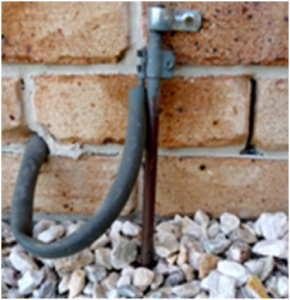 Trials in Brisbane showed that TermiteTraps placed on the ground were attacked before any of the professional in-ground monitors were attacked. Some of the in-ground monitors were attacked later on. You’d expect that. After all, the professionals have been successfully using in-ground monitors for about 15 years. 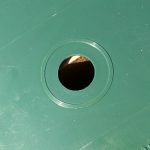 The TermiteTrap is designed with its base open to the ground and a hole is purposely left open in the top lid. 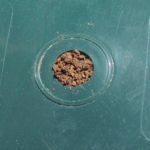 Once termites have arrived, their arrival signal is instinctive: they immediately block up the hole in the lid to conserve humidity and keep the ants out. You can notice this mud blockage as you walk past. No need to kneel, stoop — or stop. Placed about 3m apart on the surface of the garden, over the gaps in pavers, over expansion joints in concrete slabs and paths, you will always be able to find them. Being made of UV protected polypropylene, the Traps are guaranteed to last for 10 years but greenies will say they could last for 20. Why? Aren’t the building codes enough protection? Nobody should trust barriers OR outside monitors to be failsafe. Every time you see a TV news program where the usual footage shows damaged timber being crumpled up, hundreds of scurrying termites, a woman weeping and a concerned pest-man talking to the camera —it is because a barrier failed to keep termites out. If you read the preamble for all the building Codes of Practice, the Australian NZ Standards, etc., they all say the use of the barrier is not to prevent entry but to ensure the termites have to expose themselves to get into the building. Meaning they have to build their mud tunnels out in the open where they can be seen during a regular inspection. Obviously monitors placed around the outside of buildings are not barriers either. Their job is to be available in places where termite scouts are scouting —to intercept scouts before they find a way inside. The more you have around, the more chances they have of finding one. When they do, the baiting part is so simple you can hardly muck it up from there. But just in case termites have already found a way inside but haven’t done enough damage to be discovered yet, you should inspect your home or have it inspected. Can you do a good inspection? Probably. If your home is built on a slab, meaning no crawling underfloor, and if the roof void is insulated or sarked, what can a professional see that you can’t? They don’t move heavy furniture, they don’t shift the kids’ mess in built-in wardrobes or shift stuff in the linen press —but you might, because it is your home. And, you can do your inspection in the first week of spring and/or the first week of autumn when it’s not too hot up in a roof (or too cold under the house if you have a suspended floor). Inspection is like detective work; deductions of motive and opportunity. You know the termites come from the soil and work upwards. Once they get inside, all the timbers join up; studs to noggins to architraves to ceiling battens and roof trusses. 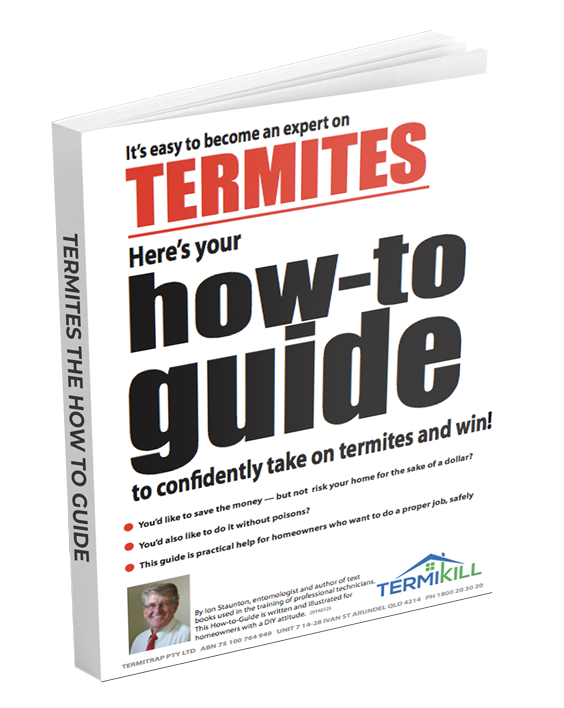 How to do your own termite inspection. 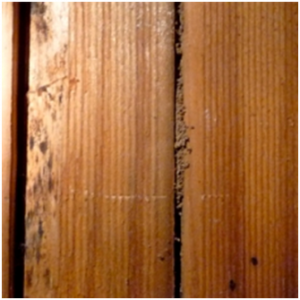 You’ll be looking for termite ‘mud’ and listening as you tap around for that hollow sound where termites have eaten all but the paint on the surface. These photos may help. 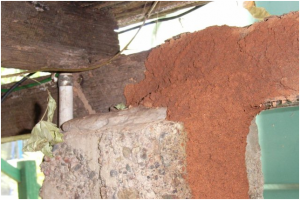 The things to remember are: the subterranean termites will be coming from the soil and when they leave it they use their ‘mud’ to protect themselves and to reduce loss of humidity. This ‘mud’ you’ll be looking for comes in the form of tunnels over impervious surfaces (or timber they’d rather not eat) or to pack up splits, cracks, grooves and joints in timber. 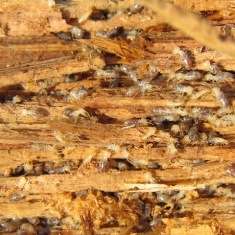 Termites are more likely to come from soil that is damp. That probably means your garden, a low area or depression, maybe the South side where the sun doesn’t dry the soil out, or maybe near a water tank, an air conditioning condensation outlet, etc. Apart from looking for ‘mud’, you will need to look out for timber surfaces (painted or not) that are uneven or wavy and distorted. You will also be using your ears. Running a tool over a timber surface gives you a sound you will quickly recognise as normal. 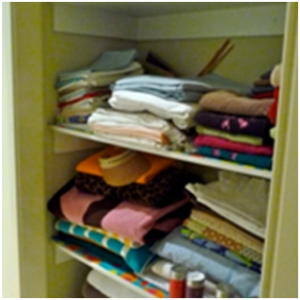 When you hear it change to a hollow sound, you investigate more closely with a sharp pointed knife or fine screwdriver. Sometimes termites only leave the paint and pressing gently you will feel the lack of solidity. With the blade aligned to the grain or length of the wood, insert it into the timber and twist (gently, always gently). Hold the little split open for a few moments; you may see the antennae or other movement of the workers and soldiers inside. Also using your ears, tapping can produce a reaction from soldiers inside the timber which sounds a little like the ratchet of an old fashioned watch; if there are hundreds in there, it can sound like dragging a screwdriver slowly over very coarse sandpaper. 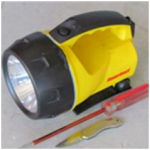 Your tools:eyes, ears, a bright torch/flashlight, a knife or small screwdriver. 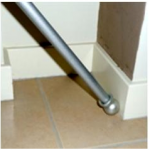 You could make a long-handled sounding implement to tap or run along skirting boards without having to stoop, or to save you some crawling to reach timbers in the roof or under the floor. I use a bit of left-over curtain rod with a round plastic finial so it doesn’t scratch or mark. (See illustration). Golf putters have been used successfully. You’ll also need a stepladder to get up into the roof void and a cloth to wipe your dirty fingermarks from the manhole cover as you come down. Outside: Poke about in your garden moving the top layers of mulch and leaf litter. Look at plant stakes, fences, wooden steps, retaining walls, posts, wooden seats and you should tilt or lift plant pots (potting mix is high in wood fibre). Look for damper areas and relate them to the rooms closest to them so you can pay a little more attention to those rooms once you go inside…and the roof areas above them. If you have a concrete slab-on-ground floor, now is the time to check every weephole. You’re looking for ‘mud’, remember? The tunnels if any, will probably follow the mortar joint between the bricks, or if no bricks…straight up and in. If plants such as mondo grass, creepers or other ground covers are blocking your view, it is time to cut them back or get out the glyphosate (Zero, Roundup) and kill them —your house is at stake! Underneath:If you have a house you can get underneath, now is the time. The good thing about suspended flooring is that there is more space between the timber in the floor and the termites in the soil and you will be able to detect any tunnels up the foundation walls or piers/stumps. Pay particular attention to corners, damp areas, chimney bases, and the top of the foundation walls under bathrooms, laundry and patios. Of course there are often stored treasures such as boxes, taxation papers, bits of wood that might come in handy one day (get the idea?). Look carefully and move anything gently and inquisitively. Inside: Start at the front door and begin tapping the architraves and skirting boards. With a torch in one hand shining along the timbers, it is easier to detect uneven surfaces in an oblique light. Keep going right (or left) tapping or running your tapper/putter and your screwdriver along every moulding you pass until you are back at the front door. This is where you beat the professionals, because you will shift the sofa, the beds and you will look in the built-in wardrobes and the linen press –won’t you? The Roof: If you haven’t found termites by now, you may feel it a waste of time and energy to go up in the roof. Why bother? Because it’s your house. And your $thousands in repair costs if termites have gone straight up the studs into the roof without hollowing out the interior mouldings. You can have great chemical and physical barriers; you can have a double ring of monitors all around your backyard and yes, you may have already killed off a colony or several, but believe me, since Captain Arthur Phillip had his first tent pegs eaten by termites in 1888, termites have found a million ways to get to wood in Australian structures. Inspecting at least once, preferably twice a year, will give you a great chance to find evidence before a door falls off or a broom goes through a skirting board. If you live in the temperate to tropical areas of Australia, I suggest you inspect during the first week of spring and the first week of autumn, because it is not as hot up in the roof and not freezing underneath. Also, if you find termite galleries, they are more likely to be occupied. 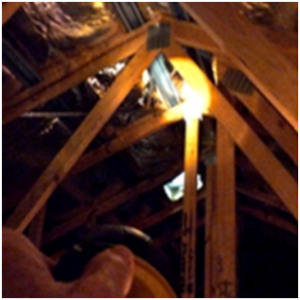 Hot timbers in a roof may be vacated during the day when you inspect and you’ll miss out on possibly hearing their return tapping. Now you have the knowledge you need to defend your home. A steel framed house. The homeowner used a single piece of pine to slightly lower the lintel above an interior doorway. Two years later, termites had found it and eaten it out. A double brick house with metal window and door frames (no timber wall frames). The only timber was in the roof 3 metres up from the concrete. They found it, thank you very much. Termites found and ate the pine timber handles of a handbag hanging on the back of a door that was always open against the wall. They’d tracked across to it from the doorframe. Want a couple of hundred more examples? Termites find their way in to houses, which means you should regularly inspect to find the action before costly damage occurs. Thinking the steel frame/barriers/Building Codes/ builders guarantee is going to prevent a bad termite experience is just thinking of the wishful kind. Treat any trees that may be hollow and within at least 50 metres of buildings. Same for mounds in the ground or those in trees that you can reach. 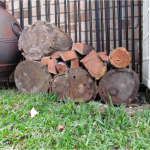 Firewood should be kept either on a concrete slab or on a patch of insecticidally treated soil so you can observe if termites tunnel up over the edge of the slab. Or, they have to find a gap in the layer of treated soil under the pile. Keep the edge of the house slab clear so you can see any tunnel —which means no soil, mulch, grass or garden plants to obscure your view. If yours is a suspended floor, the temptation is to store stuff under the house. That’s OK, but always keep things away from the piers/stumps and the foundation walls so you can see. Actually it is not OK to store timber, or cardboard cartons of books or old tax papers. Paper and cardboard are cellulose —same as wood. 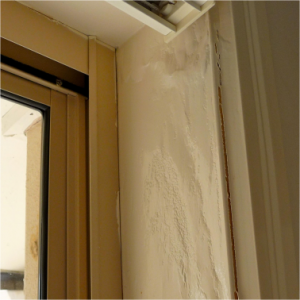 Add ons or extensions to buildings increase the incidence of termite attack unless you have ensured there are no unprotected gaps between the new slab and the original. Granny flats, rumpus rooms, a veranda, a pergola, a cubby house, a dog kennel or a pump house or pump-screen —these additions may provide a bridge across otherwise effective barriers. Everyone, including us, mentions weepholes in the brick or block external walls as an easy entry point. It happens, but not anywhere near as often as you might think. Plugging up these holes with nylon flyscreen mesh will stop the scouts getting inside to see what they might find. Sure, termites sometimes eat electrical conduit and cable insulation when they are feeding on timber, but the scout is not going to waste time chewing its way through a nylon-plugged weephole. 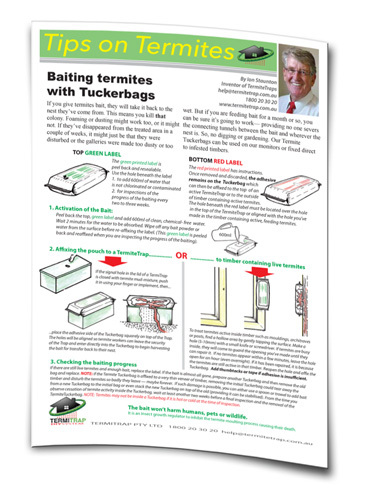 Provide termite scouts with a food source that is easy for them to find which then doubles as a baiting point once you know they have arrived. We’re biased. 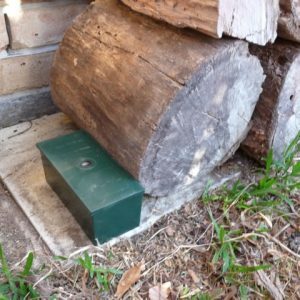 We believe that placing termite traps as decoys around buildings where there is little or no alternate timber is your most cost/effective action to intercept scouts. 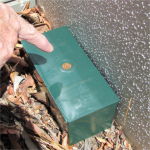 When the termite ‘tunnelling crew’ arrive, the Trap is easy to seal to control humidity, including the instinctive sealing of the hole in the lid to let you know that it is time to begin baiting. 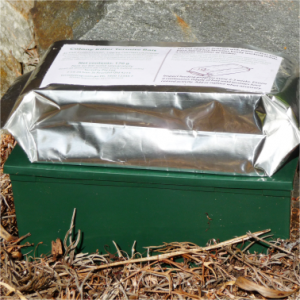 We’ve even designed it so the baiting is done without having to open the Trap and risk disturbing them.